Zarh Myron Bickford was one of the foremost mandolin players, composers and teachers of his time, and is best known for authoring The Bickford Mandolin Method, a four-volume collection considered one of the finest to come from an American author. Married in 1915 to the prominent guitar player Vadah Olcott-Bickford (born Ethel Lucretia Olcott), they often performed together. Both shared an interest in astrology and the names Vahdah and Zarh reflect this interest. A programme of compositions by great composers written for the mandolin and guitar. 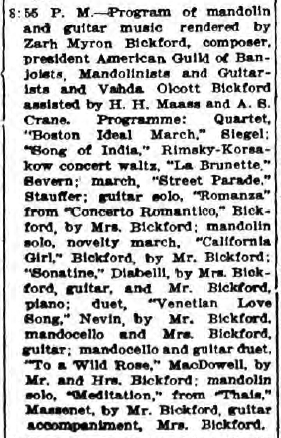 On Saturday evening last the Waldorf appartements in the Waldorf-Astoria, Manhatten, were filled to overflowing with a fashionable audience, for the concert of the Bickford-Kitchener coterie of mandolin, banjo, guitar and fretted instruments. Mme Valdah Olcott-Bickford and Zarh Myron Bickford, and W. J. Kitchener, the eminent authority on mandolin and banjo music, gave a programme of infinite variety, showing the scope of these instruments in a remarkable manner. They were assisted by ensemble players who are all unter these master-teachers, the New York Mandolin Ensemble (50 players), New York Junior Mandolin Club, Columbia University Mandolin Club, Horace Mann School Mandolin Club, Hawaiian Ensemble and the Lutina Trio. Harry L. Hunt was the singer assisting. The programme opened with the National Anthem, rendered by the entire New York Mandolin Ensemble, conducted by W. J. Kitchener, and as an instance of what can be done by a skilled artist on the banjo, Mr. Kitchener did Schubert's "March Militaire," and gave a superb rendition of "Hark, hark, the Lark." In tone an technic Mr. Kitchener's work suggested that of the great violinists. He certainly got all that could be secured in effect from the banjo. He is the instructor in mpost of the big schools an colleges near New York, and has a big list of private pupils too. Mme. Bickford played the first concerts for guitar, by an American composer, Zarh Bickford, and its three movements were full of interest and originality. Mr. Hurd has a fine tenor voice which he used to excellent advantage. He did three interesting English songs by Mr. Bickford. There were medleys of popular war songs by the various groups and the evening was oneof great pleasure to several hundred people. A number of prominent persons were present and there was a long list of patronesses. 8:55 P. M. - Program of mandolin and guitar music rendered by Zarh Myron Bickford, composer, president American Guild of Banjoists, Mandolinists and Guitarists and Vahda Olcott Bickford assisted by H.H. Maass and A.S. Crane. 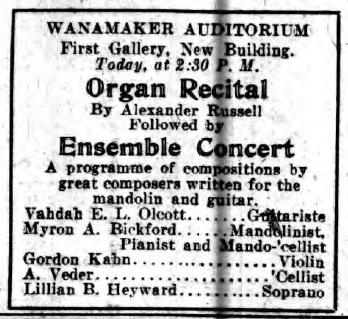 Programme: Quartet, "Boston Ideal March," Siegel: "Song of India," Rimsky-Korsakow concert waltz, "La Brunette," Severn, march, "Street Parade," Stauffer; guitar solo, "Romanza" from "Concerto Romantico," Bickford, by Mrs. Bickford; mandolin solo, novelty march, "California Girl," Bickford, by Mr. Bickford, "Sonatine," Diabelli, by Mrs. Bickford, guitar and Mr. Bickford, piano; duet, "Venetian Love Song," Nevin, by Mr. Bickford mandocello and Mrs. Bickford, guitar; mandocello and guitar duet, "To a Wild Rose," MacDowell, by Mr. and Mrs. Bickford; mandolin solo, "Meditation," from "Thais," Massenet, by Mr. Bickford, guitar accompaniment, Mrs. Bickford.